In forex trading, we can get profit only when the price moves. Yes, Only when the price moves. Whether it's moving up or moving down. Well, the tendency of prices to move to a direction is called a trend. 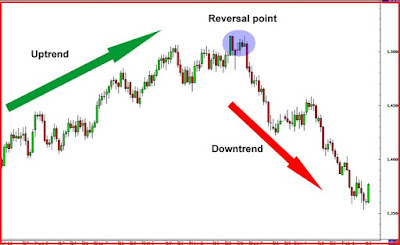 The trend is very useful and is the most important part of determining your position in the trade. 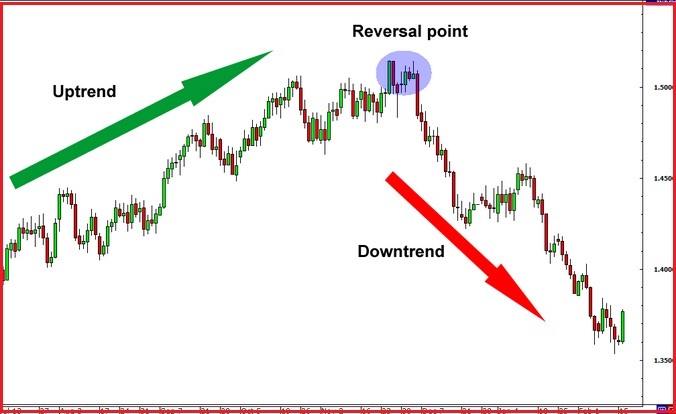 Due the position on the trading are only two, buy and sell, then any trend has only two types namely uptrend and downtrend. Just imagine, if we didn't know how to look for trends in price movements like this. When the price trend was down, you open a buy position, and vice versa when the price moves up, you open a sell position. So, determining the trend is very important and you should not ignore it. If you ignore it, then your trading will just be a gambling. If you underestimate it, the market then will kick you up to a painful of days and sometimes months. Depending on the social effects because you lose some money. Most of the technical analysis is used to predict the trend and the extent to which the trend will last. Some indicators like Moving Averages or Parabolic SAR is also used to figure out which way the market was running. However, there are circumstances where the market does not move up or down, commonly called sideway. In such circumstances, opening a buy or sell position equal to spending a patience that ultimately erodes your emotions in trading. Normally, the sideway situation has occurred when European or American markets are closed or waiting for the big news. In such circumstances, there is not much trading going on, thus causing sideway situations. Well, avoid this situation. Other terms you need to know is commonly called Support and Resistance. Now, let’s look together when a trend is in progress. Say it, an ongoing uptrend. Is there a trend that never ends? Of course not. Any increase will reach its peak then paused, and then continued with the downturn. Likewise, when the price moves down, there was a time when the decline stops, and the price back to up. 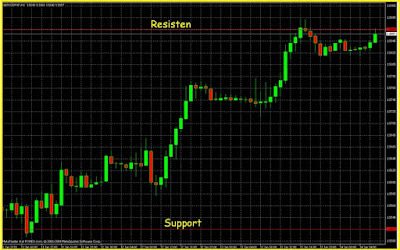 The points where the increase and decrease in the price are stopping is called support and resistance points. 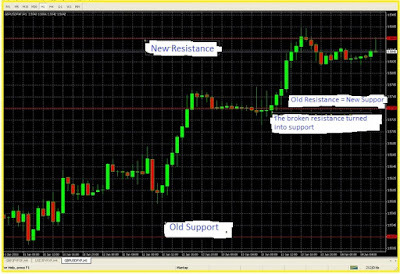 The lower limit of normal price movement called Support, while for upper limit commonly referred to as Resistance. Later, these two points are very vital in your trading. Without knowing the points then we can only follow the trend without knowing the actual age of the trend is not going to be much longer and will be replaced by reversal, trend, or sideway. 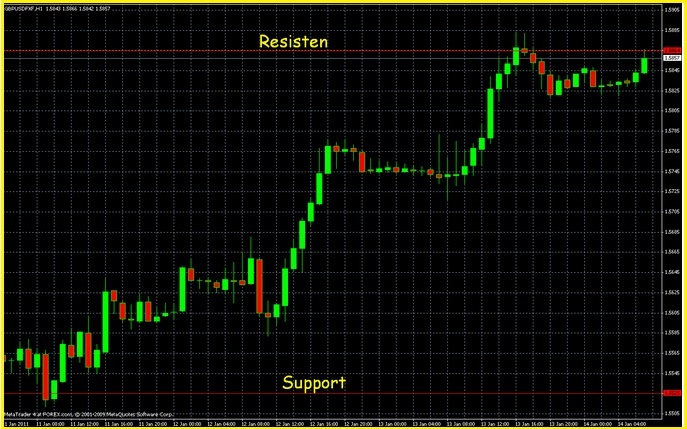 There are many ways to determining support and resistance levels. Some traders useindicators to figure it out. Others use Fibonacci Sequence, while others use a history of price movements in the past. I myself do not want to get too giddy to calculate support/resistance by using complicated calculations. For me, it's been quite elaborate with forex analysis and complex psychology in it. So, why don't we just simplify? Sometimes, simple was better. The above graph is a graph for GBPUSD on January 14, 2011, with a period of 1 hour. Note that the price moves up but does not exceed the area that had marked a line in blue. When the price moves up to approaching 1.5885 then as if the price is losing its ability to continue moving up to passing that point. And vice versa when it’s moves down, the price can not penetrate the point which is the lowest limit is 1.5575. The point of 1.5885 is called resistance, and 1.5575 is called support. The second point is actually a reflection of psychological point recognized by market participants simultaneously. As we know basically, price movements are determined by the law of demand and supply (supply and demand). When demand goes up, while supplies are not enough then the currency will strengthen, and vice versa, when there were many supplies, and the demand is small then the currency will weaken due to the supply abundance in the circulation of the market. Well, for example in case of a price is on uptrend, then psychologically it will cause a big snowball scrolled. When prices start creeping up, then, as usual, traders would follow the ongoing trend and take a buy position. This has resulted in rising demand, so prices continue to move up. But on the other hand, the majority of traders are also anticipating the end of the trend by taking a certain resistance point. At that point, they no longer do Buy action, instead, they will perform the profit taking action by selling the currency that they have bought it previously. Well, if everyone does so, the demand is reduced automatically and rising currencies began to lose power. As a result, the price will back down. So the key is how to determine support and resistance points to the same with the market support/resistance markets, collectively. If we know these points, then trading will be much easier. So, now comes a new question in the minds: Could it’s support and resistance points be penetrated by price movements? The answer is Maybe. It is difficult but possible. In the situation where the buyer is winning and the seller is the losing, of course, the price may continue to rise although it has reached the resistance points. In this circumstance, then the sound of the market to determine the support and resistance is divided into several groups. One group estimates the price will not go up to a certain level, while the other group argues that the price can go up passing the specified level determined by the first group. If the second group is the winner, of course, support or resistance will break. This is a graph of the DOLLAR by using the 1-hour time frame. It appears on a given area of the sign of the circle, the price broke through the resistance points. As a result, prices are moving increasingly away from that point to and forming a new resistance point on a horizontal line at the top. The resistance points that was once penetrated now changed to a new support to point, and now the price is moving on to a new range. Now, the next question that is left is how to know that the price will break through or do not penetrate (break) the support/resistance points? When it's up here, you have to learn some technical analysis instruments, particularly was oscillator type for knowing the buy saturated point (overbought) or saturated offers (oversold). It should be also taken into account about the happening fundamental situations. It was not easy. Most of the people who know the critical points, whether support and resistance will break is based on experience after many years of trading. So it must be admitted that the experience was important. OK, we get the next point of technical analysis, that is, a term named as overbought and oversold or commonly abbreviated as OB and OS. OB and OS is a situation where the price cannot continue the trends because it was too expensive or too cheap, so that trend cannot continue. Unlike support and resistance which is the psychological level, which essentially is just an unofficial mutual agreements among the traders, the OB and OS itself is habitual, manifest, and occurring on the market (not just psychological things). Suppose, a rising trend is ongoing, then in this circumstance, the currency becomes more expensive than usual. If we find the graph of GBPUSD is climb uphill, it means the worth of GBP is increasing compared to USD. Market makers continuously to buy or hold the GBP because the hope that the price will continue to go up and they still have enough capital to do a purchase action. But there will be a point where the buyer is no longer possible to buy GBP due to its price was too expensive. Buyer's opinion not only that the price is too expensive, but more than that, it is their capital can not be sufficient to buy a specific amount in GBP. Well, this state is called Overbought. Conversely, when the downtrend is going on, there will be a point where the price will stop the downtrend because the sale price is already too cheap so that the seller is no longer possible to sell its currency, or they will be losers. This is called Oversold. In this circumstance, the price reaches the point of OB or the OS, then the expected price would turn direction and trend will soon cease. So, when the price is moving up and OB point is already reached, then prices will come back, the rising trend will stop, and then replaced by the fall motions in the currency. Vice versa, when the price moves down, and then entered the OS areas, then the prices will move up, and the downtrend was stopped. Often, OB and OS occurred at that Support and Resistance points because that was at the same functions i.e. as a trend counters. However, it is not always the case. Of course, buy and sell decisions will be crucial if the prices are not on extreme points. Now, the question is how to determine the OB and OS points? 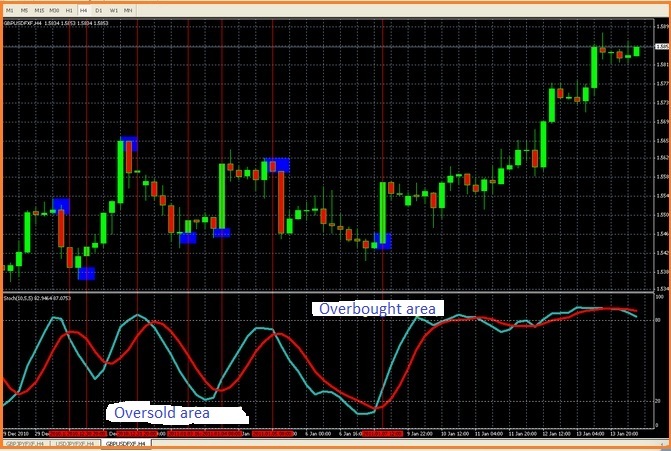 The easiest way is to use an indicator which is was Oscillator type such as RSI or Stochastic. These indicators are indeed designed to determine the OB and OS points. The area shaded with the blue color is overbought areas and oversold areas. You can see it on the blue rectangle, which I describe. When the price moves down, and then touched the oversold areas then the price back move up because the price is too cheap for sale by the seller. The same situation also occurs in the overbought areas. 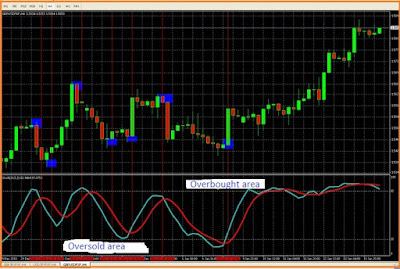 About how to use Stochastic in more details, we will discuss at the next session of technical analysis. Please be patient. Well, with that in mind, we can estimate when a trend ended and was replaced with the next trend. Thus, we can set a timing for the better opening position.